Cranioplasty is defined as the surgical repair of acquired or congenital cranial defects. The objective of cranioplasty includes protection of brain, reconstruction of lost anatomical part, and esthetics. There are many indications of cranioplasty such as trauma, decompressive craniectomies, tumors, complications of previous cranioplasties, and congenital deformities. Rehabilitation of patients with cranial defects requires a multidisciplinary approach, and such patients often pose a challenge to the operating team and prosthodontist. There are several materials available for cranioplasty, out of which polymethylmethacrylate (PMMA) is one of the most commonly used alloplastic graft materials. With the advances in bioengineering, rapid prototyping technology (RPT) has evolved and finds its place in cranioplasty also. RPT was originally developed and used in the automobile industry for the fabrication of prototype of new model. Nowadays, RPT is in clinical use for the fabrication of custom templates, skull templates, and direct prosthesis fabrication., RPT is an additive manufacturing technique which is also known as three-dimensional (3D) printing. Methodologies of 3D printing which are commonly used in dentistry are fused deposition modeling (FDM), selective laser sintering (SLS), stereolithography, and polyjet polymerization. In this technique, resin materials such as nylon, acrylonitrile, acrylonitrile butadiene styrene (ABS), and polylactic acid are added in layers and subsequently cured by ultraviolet (UV) light to form a complete model. This series of two cases explains two different techniques for the rehabilitation of the patient with frontotemporoparietal cranial defect using RPT. In both cases, decompression craniotomy was performed which leads to defect. Poor neuromuscular control in both cases impedes with the upright posture of the head during conventional impression procedure-made RPT an ideal technique for their rehabilitation. In Case 1, prosthesis was made on a skull template, while in Case 2, direct prototype of the prosthesis was printed using the data of 3D-computed tomography (CT) scan images. A 50-year-old male reported to the Department of Prosthodontics for rehabilitation of cranial defect. A detailed history revealed that the patient had cerebrovascular accident 8 months back. Cranial decompression was planned which led to frontotemporoparietal defect of 10 cm × 15 cm in dimension. Gradually, cerebrospinal fluid (CSF) was accumulated in the defect leading to a diffuse swelling over the temporoparietal region. This diffuse accumulation of CSF made delineation of underlying bony margins difficult and led to inaccurate impression of the defected area. Hence, multidisciplinary approach was planned which involved the role of a neurosurgeon, oral and maxillofacial surgeon, and prosthodontist for cranioplasty with simultaneous CSF drain. A preoperative CT scan of the patient was made with each slice size of 1 mm × 1 mm [Figure 1]a. Standard tessellation language (STL) images were created from CT scan images with the help of software [Figure 1]b. Then, these STL format images were transferred to the 3D printer. FDM method of RPT was used in both cases as discussed here. In this technique, resin material of acrylonitrile was pulled from spool of resin tank and laid down on the printer platform with the help of an extruder mounted on the printer in layers and cured subsequently by UV light. This extruder can move in 3D axis to form the skull template according to the STL format image [Figure 2]a. The skull template was hollow, so for the fabrication of wax pattern of defect area, a tentative base of paper and aluminum foil was made followed by plaster of paris (POP) (Kaldent, Kalabhai, Karskarson Pvt. Ltd.,) base [Figure 2]b over it which acted as a firm base for the wax pattern fabrication [Figure 3]a. This base was made to maintain depth of 3–4 mm for the wax pattern which was carved manually according to the contours of contralateral side. The wax pattern was then made of modeling wax (Y-Dent No 2 Modeling wax, MDM Corp, India) maintaining uniform thickness of 3 mm. Trying of wax pattern was not required in this case as skull template was an exact replica of the skull defect area with no magnification. Hence, direct final prosthesis was made with high precision and accuracy on the skull template in the absence of the patient. Wax pattern was kept on the skull template till flasking. Before flasking, wax pattern margins were again readapted with a hot wax instrument over the template. All conventional laboratory procedures such as flasking [Figure 3]b, dewaxing, packing of the mold in clear heat-cured PMMA (DPI-Heat Cure, Dental Products of India Ltd., India), and curing were performed to transform wax pattern into a biocompatible PMMA prosthesis cured by long curing cycle. In this cycle, the prosthesis was processed at 74°C water bath for 8 h followed by increasing temperature to 100°C for 1 h. After completion of cycle, flask was cooled slowly to room temperature. In this, flask was removed from the water and bench, cooled for 30 min followed by immersion in tap water for 15 min. Then, the prosthesis was deflasked and prepared for insertion. After finishing and polishing of the prosthesis, numerous holes were made of 1 mm diameter at a distance of 1.5–2 mm apart [Figure 3]c. These perforations prevent the development of an epidural hematoma, permit escape of underlying fluid, and its absorption by the lymphatics and allow for in growth of fibrous connective tissue. The holes also provide a mean for securing prosthesis to underlying bone. Then, prosthesis was immersed in distilled water at 37°C for 24 h to leach out any residual monomer followed by immersion in 2% glutaraldehyde (Cidex OPA, Johnson and Johnson, USA) for 48 h for sterilization. Surgical procedure was carried out under general anesthesia. The planned incision was marked over healthy tissue away from the area of reconstruction. The cutaneous incision was opened in segments and dissection was performed to delineate margins of entire defect. The fit of the margins of the cranial prosthesis was checked and found to be accurate. Then, prosthesis was fixed firmly to the desired area by miniplate fixation. Closure was then performed in layers using vicryl to close the underlying tissues, and finally, the skin was sutured. A drain was placed and removed after 3 days. Postoperative care of surgical site was given to the patient and follow-up appointments were scheduled weekly for 4 weeks to check for postoperative complications. The patient was advised to avoid direct impact on the site of cranioplasty and to maintain the hygiene around the surgical site. 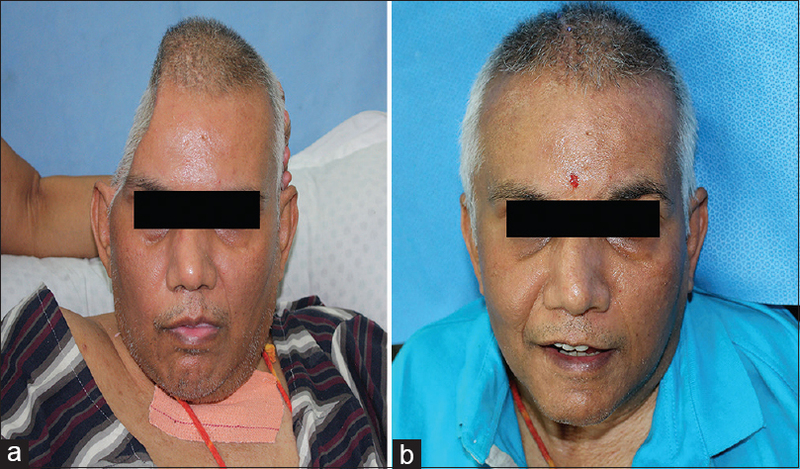 On comparison with preoperative view [Figure 4]a, patient showed excellent esthetics at the end of 2 weeks postoperatively [Figure 4]b. A 45-year-old reported to the department for the correction of cranial defect. A detailed history revealed that the patient had road traffic accident 1 year back which led to cranial defect of the right side of 10 cm × 12 cm in dimension. Glasgow Coma Scale score of the patient was 7, and due to poor neuromuscular control, head position of the patient was not stable which led to impression of defect area difficult. Hence, the patient was planned to rehabilitate using RPT. 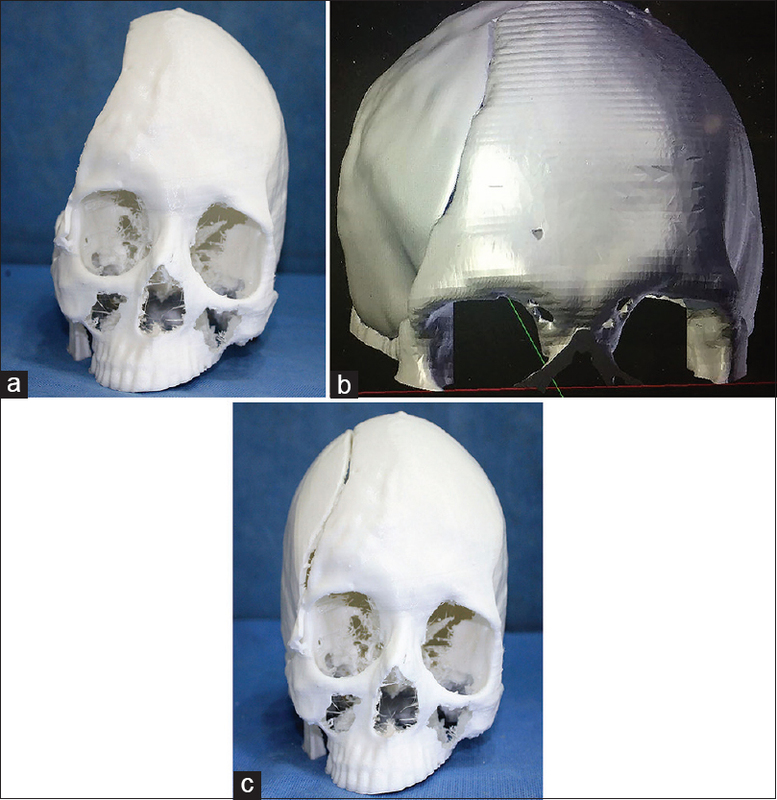 In this case, along with the skull template as discussed in the previous case, a template for defect area was also printed [Figure 5]a. In this technique, mirroring of the normal contralateral side was done. Then, the defect area which was digitally reconstructed in the designing software and reconstructed design was printed using RPT [Figure 5]b. 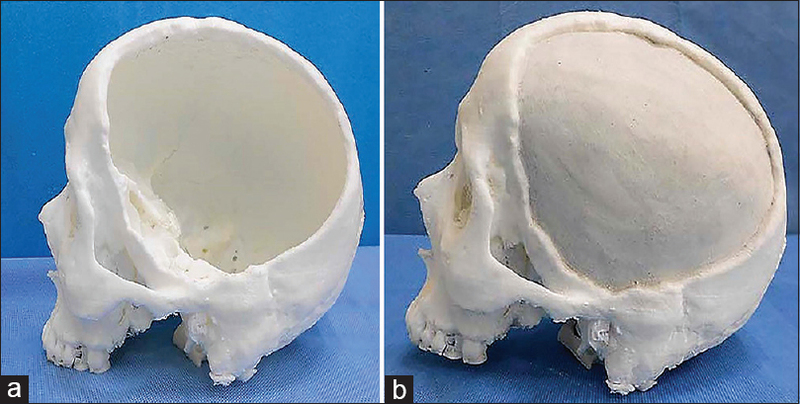 After printing, the accuracy of the reconstructed template was checked on the 3D-printed skull [Figure 5]c, and minor corrections were done using wax (Y-Dent No 2 Modeling wax, MDM Corp, India). After this, the reconstructed template was directly flasked in POP (Kaldent, Kalabhai, Karskarson Pvt. Ltd.,), dewaxed, and packed with clear heat-cured PMMA resin (DPI-Heat Cure, Dental Products of India Ltd, India) cured using long curing cycle [Figure 6]a and [Figure 6]b. Rest, the same procedures were followed as described in the previous case. Postoperative care of surgical site was given to the patient, and follow-up appointments were scheduled weekly for 4 weeks to check for postoperative complications. The patient was advised to avoid direct impact on the site of cranioplasty and to maintain the hygiene around the surgical site. 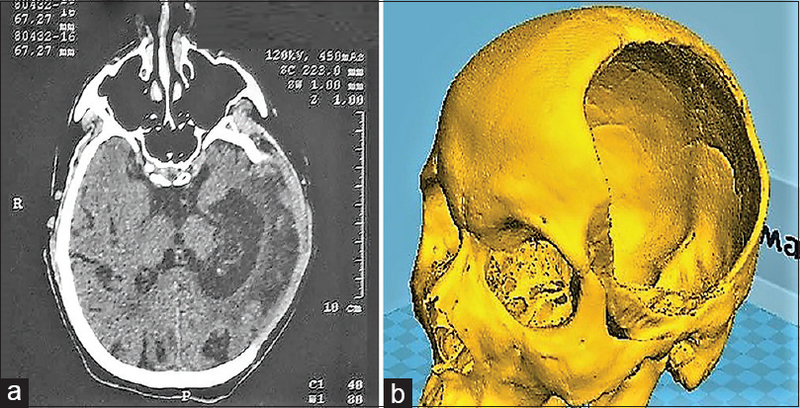 The patient showed excellent esthetics at the end of 2 weeks [Figure 7]a and [Figure 7]b.
Cranioplasty is defined as the surgical repair of acquired defects or congenital deformities of the cranium using biocompatible material. Trauma is one of the most common acquired causes leading to cranioplasty. The main aim of the cranioplasty is to provide protection to the intracranial component and improvement of disfigured esthetics. History of cranioplasty starts from 7000 BC. Many materials were used over these years for cranioplasty. These are divided as autografts, allografts, and xenografts. The patient existing cranial bone flap is the most commonly used autograft. Allografts were also used as an alternative to autografts in which cartilage of cadaveric origin was used in initial days. Xenografts were also used in the past for cranioplasty. However, these grafts are not used nowadays apart from autografts. Nowadays, synthetic graft materials known as alloplasts are available. Alloplasts are divided as metallic and nonmetallic alloplasts. Metal grafts include aluminum, gold, silver, tantalum, stainless steel, and titanium. On the other hand, nonmetallic alloplasts include celluloids, PMMA, hydroxyapatite, polyethylene, chorale, ceramic, cortoss, carbon-fiber-reinforced-polymer, and recently introduced polyether ether ketone which are used in orthopedics as an implant material. Conventional technique is usually used for rehabilitation of cranial defects which is an extensive procedure and includes clinical and laboratory steps. But its application is limited in cases where precise delineation of underlying bony margins is difficult as it may compromises fit of prosthesis. In recent times, 3D printing gives a promising solution in treating patients of larger defects with precision. Some principles of RPT which are commonly used in dentistry are SLS, FDM, stereolithography, and polyjet photopolymerization.,, RPT has shown promising results in maxillofacial reconstruction, orthognathic surgeries, craniosynostosis, maxillofacial tumor surgeries, and cranioplasties. The skull template was made in both cases which was made using FDM for the fabrication of prosthesis. This additive technology utilizes the addition of resin materials such as nylon and acrylonitrile in layer-wise manner to complete formation of template. However, advantages of RPT over conventional technique are as follows: (a) impression of cranium is not required, (b) no wastage of material, (c) superior esthetics, (d) accurate prosthesis in terms of fit and dimensions of defect, (e) less time consuming, and (f) less intraoperative time. Out of two techniques, in Case 1, skull template was used, on which wax pattern was made, but in Case 2, the defect area was digitally reconstructed and designed part was printed separately along with the skull template. Less intraoperative corrections were required in Case 2 as a uniform thickness of prosthesis was ensured which was designed digitally as compared to the first case as prosthesis was carved manually, and readaptation of wax pattern is required before flasking. Furthermore, no wax pattern was used in Case 2, and hence, manufacturing errors associated with distortion of wax pattern was avoided. Less time is required for the fabrication of prosthesis in Case 2 as fewer number of steps were involved as compared to the previous case. Main strengths of these techniques are as follows: (a) it utilizes RPT which is a digital and additive technique for the fabrication of skull template with high accuracy and precision, (b) fewer chances of incorporation of errors, (c) fewer steps are involved in fabrication hence less time consuming, and (d) no wastage of material as this is an additive manufacturing technique as compared to CAD/CAM. Whereas, limitations are (a) this technique is costly and requires a specialized setup with trained personnel for the designing and printing of models and (b) biocompatible 3D printable alloplastic materials are not available except for titanium. The informed consent was obtained from both the patients for publication. Fewer chances of errors as fewer steps are involved as compared to conventional techniques. RPT is the advanced and predictive method of fabrication of prosthesis for rehabilitating patients with large cranial defects. Accuracy, safe, no wastage of material, and superior esthetics are few major advantages of this technique. Infection is the most feared complication of allograft implants; however, PMMA is biocompatible and most widely used. The integration of latest and superior technology with the biocompatible material results in the fabrication of prosthesis which is safe and has yielded excellent results. 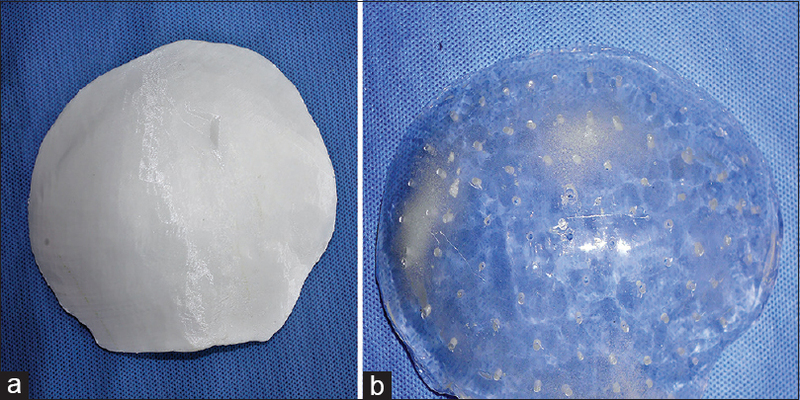 Caro-Osorio E, De la Garza-Ramos R, Martínez-Sánchez SR, Olazarán-Salinas F. Cranioplasty with polymethylmethacrylate prostheses fabricated by hand using original bone flaps: Technical note and surgical outcomes. Surg Neurol Int 2013;4:136. Parthiban JK, Abirami O, Murugan AM, Radhakrishnan R. Custom cranioplasty using rapid prototyping technology. Neurol India 2004;52:520. D'Urso PS, Earwaker WJ, Barker TM, Redmond MJ, Thompson RG, Effeney DJ, et al. Custom cranioplasty using stereolithography and acrylic. Br J Plast Surg 2000;53:200-4. Arun Kumar KV, Singla NK, Gowda ME, Kumar D, Legha VS. Current concepts in restoring acquired cranial defects. J Indian Prosthodont Soc 2014;14:14-7. Aydin S, Kucukyuruk B, Abuzayed B, Aydin S, Sanus GZ. Cranioplasty: Review of materials and techniques. J Neurosci Rural Pract 2011;2:162-7. Joseph TM, Ravichandran R, Harshakumar K, Lylajam S. Prosthetic rehabilitation in neurosurgical cranioplasty. J Indian Prosthodont Soc 2018;18:76-81. Zoltan B, Gabor T, Istvan H. Substitution of skull defects with methyl methacrylate. Magy traumatol Orthop Helyreallito Seb 1976;19:259-68. Van Gool AV. Performed polymethyl methacrylate cranioplasties. J Maxillofac Surg 1985;13:2-8. Goyal S, Goyal MK. 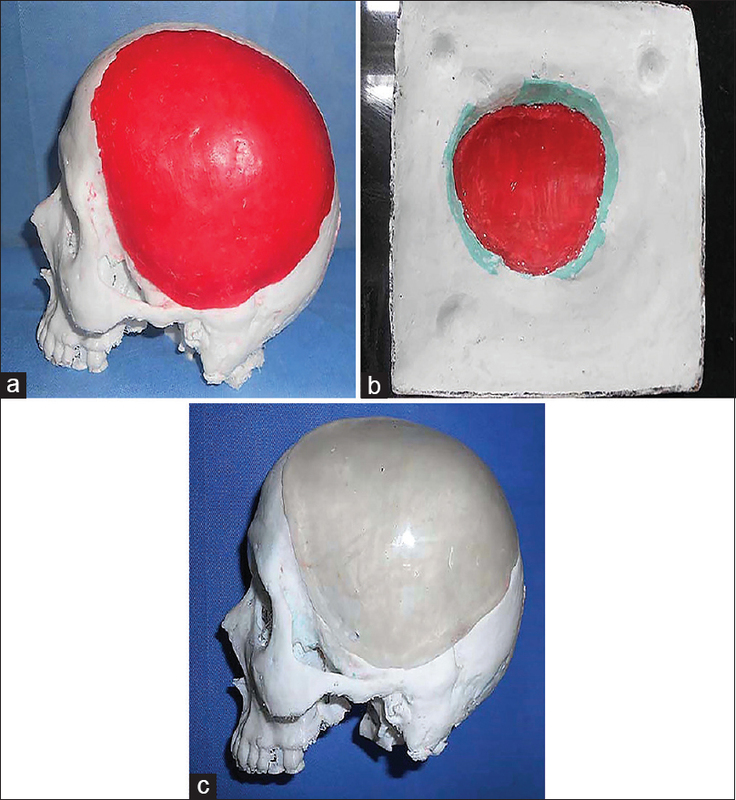 Restoration of large cranial defect for cranioplasty with alloplastic cranial implant material: A case report. J Indian Prosthodont Soc 2014;14:191-4. Groth C, Kravitz ND, Jones PE, Graham JW, Redmond WR. Three-dimensional printing technology. J Clin Orthod 2014;48:475-85.
van Putten MC Jr., Yamada S. Alloplastic cranial implants made from computed tomographic scan-generated casts. J Prosthet Dent 1992;68:103-8. Gupta L, Aparna I, Balakrishnan D, Deenadayalan L, Hegde P, Agarwal P, et al. 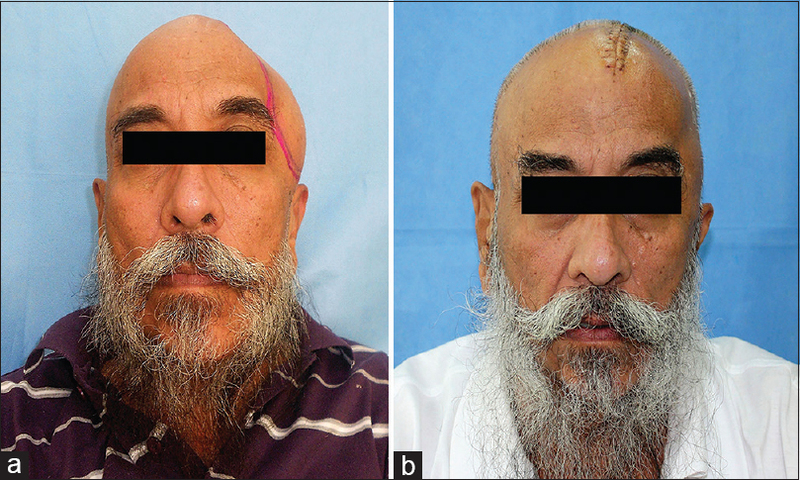 Cranioplasty with custom made alloplastic prosthetic implant: A case report. World J Clin Cases 2014;2:482-7. Tack P, Victor J, Gemmel P, Annemans L 3D-printing techniques in a medical setting: A systematic literature review. Biomed Eng Online 2016;15:115.